an establishment that breeds puppies for sale, typically on an intensive basis and in conditions regarded as inhumane. 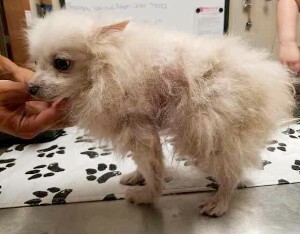 Puppy mill dogs can have many physical and emotional scars, please click the image above for more information on puppy mills and what you can do to help. Dogs that arrive at our shelter that have been saved from puppy mills come to us in a variety of conditions. Most of these dogs have never been beyond the confines of their kennels, they have never touched grass, they have never had the comfort of a bed, they haven't felt love or the comfort of a safe home. These dogs have been bred over and over again, so much so that most are littered with mammory tumors and hernias. We have taken in dogs that have had all of their teeth pulled by puppy mill breeders so more dogs can be kenneled together and won't bite each other if they attack. These dogs have had a life beyond what we could even begin to imagine and it's our goal to find them someone that will take their time and offer their patience and their love to give these dogs the best that life can offer for however many years they may have left. The majority of these dogs are not potty trained, and some have reached the age where potty training becomes difficult. The majority of these dogs don't know what a leash is, or how to walk on one. The majority of these dogs don't know how to play, they don't know what toys are, they don't know how to be a dog. The majority of these dogs are terrified and will simply cower in the corner because they have never been touched or socialized. The majority of these dogs take a lot of work for the selfless humans that take on the challenge of rescuing them. But for those that do, it is one of the most rewarding experiences of their lives. If you have decided to take on the challenge, please see below for our tips on how to train your new puppy mill rescue. Here are some things you will need to do before you bring your rescued puppy mill dog home. As much as you want to pick up and cuddle your new dog, it's probably the last thing they want from you, but that doesn't mean you won't get to that point. Potty training can be a very frustrating thing when taking home a puppy mill dog, especially if you don't know how to help them. If you have more questions, please contact us at (402)750-4665. We also have a packet of information available at the shelter with more training tips for puppy mill dogs.